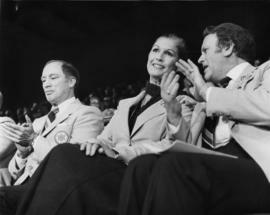 Photograph depicts Iona Campagnolo, Pierre Trudeau, and an unknown man clapping at the opening of the Canada Winter Games in Brandon Manitoba. 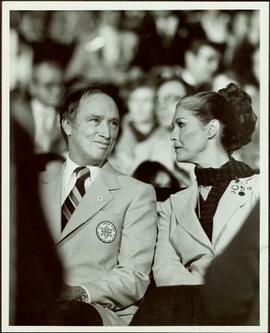 Photograph depicts Iona Campagnolo and an unknown man at the Canada Winter Games press conference at Hotel Fort Garry in Brandon Manitoba. 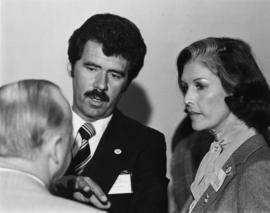 Photograph depicts Iona Campagnolo speaking with unknown men at the Canada Winter Games press conference at Hotel Fort Garry in Brandon Manitoba. 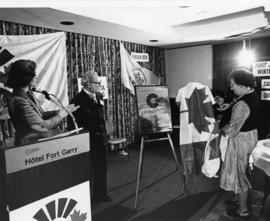 Photograph depicts Iona Campagnolo and others looking at a plaque at the Canada Winter Games press conference in Hotel Fort Garry in Brandon Manitoba. 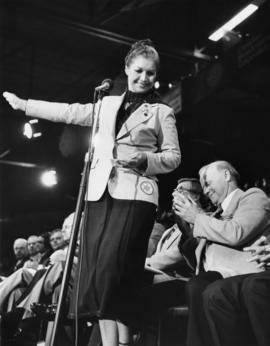 Photograph depicts Iona Campagnolo applauding with two unknown men at the opening of the Canada Winter Games in Brandon Manitoba. 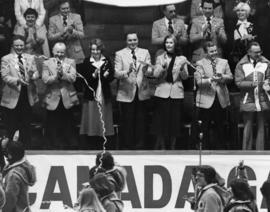 Photograph depicts Iona Campagnolo waving to the crowd while Canada Games president Alex Matheson applauds, at the opening of the Canada Winter Games in Brandon Manitoba. 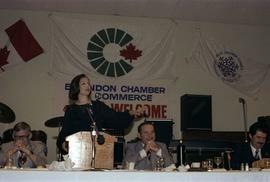 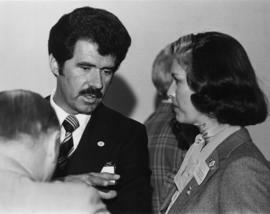 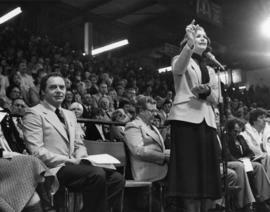 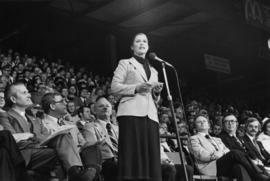 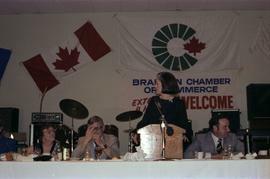 Photograph depicts Iona Campagnolo speaking into a microphone at the kick-off for the 1979 Canada Winter Games in Brandon Manitoba. 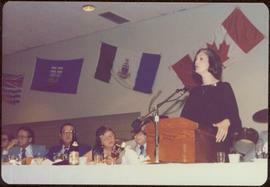 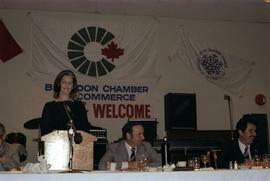 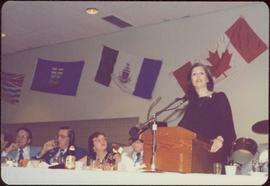 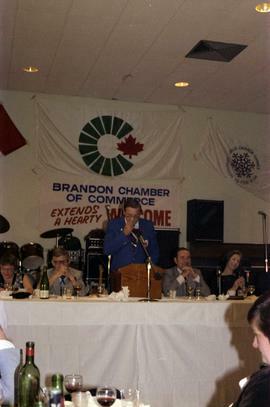 Photograph depicts Iona Campagnolo speaking into a microphone from the head table at the kick-off for the 1979 Canada Winter Games in Brandon Manitoba. 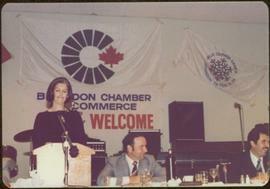 Photograph depicts Iona Campagnolo standing at a microphone at the kick-off for the 1979 Canada Winter Games in Brandon Manitoba. 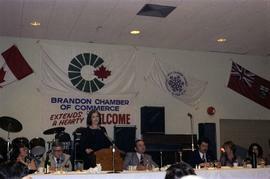 Photograph depicts Iona Campagnolo glancing sideways while standing at a microphone at the kick-off for the 1979 Canada Winter Games in Brandon Manitoba. 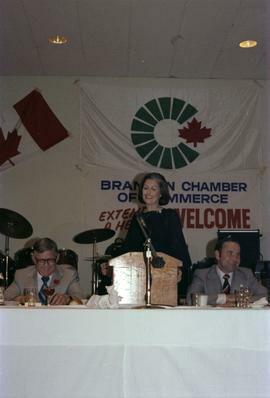 Photograph depicts Iona Campagnolo smiling while standing at a microphone at the kick-off for the 1979 Canada Winter Games in Brandon Manitoba. 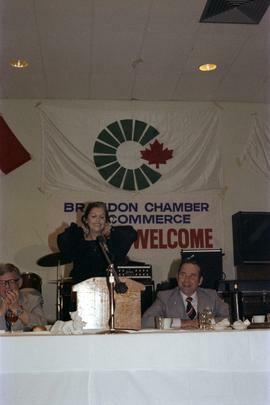 Photograph depicts Iona Campagnolo gesturing while speaking into a microphone at the kick-off for the 1979 Canada Winter Games in Brandon Manitoba. 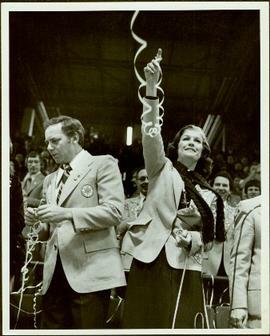 Photograph depicts Iona Campagnolo with raised arm celebrating with the crowd at the opening of the Canada Winter Games in Brandon Manitoba. 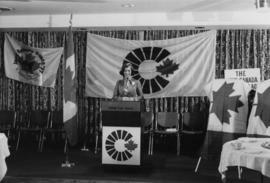 Photograph depicts Iona Campagnolo speaking at the Canada Winter Games press conference at Hotel Fort Garry in Brandon Manitoba. 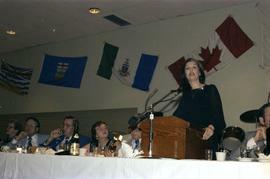 Photograph depicts Iona Campagnolo speaking into a microphone at the Canada Winter Games press conference at Hotel Fort Garry in Brandon Manitoba. 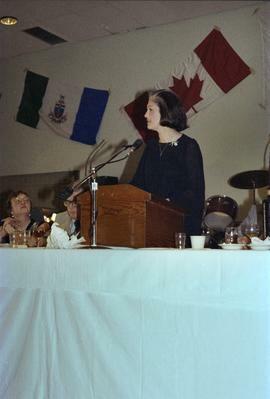 Photograph depicts Iona Campagnolo speaking into a microphone in front of a crowd at the opening of the Canada Winter Games in Brandon Manitoba. 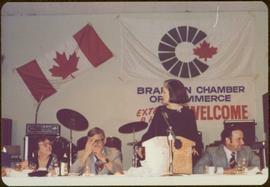 Photograph depicts Iona Campagnolo speaking to the crowd, including Canada Games president Alex Matheson, at the opening of the Canada Winter Games in Brandon Manitoba. 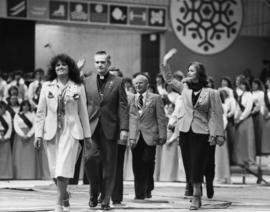 Photograph depicts Iona Campagnolo walking and waving with Canada Games president Alex Matheson and others at the opening of the Canada Winter Games in Brandon Manitoba. 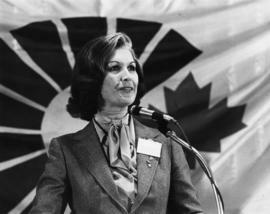 Photograph depicts Iona Campagnolo applauding the athletes parade at the opening of the Canada Winter Games in Brandon Manitoba. 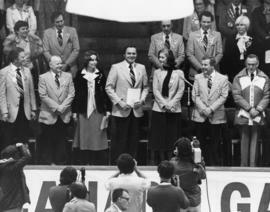 Photograph depicts Iona Campagnolo standing with honoured guests in front of reporters at the opening of the Canada Winter Games in Brandon Manitoba. 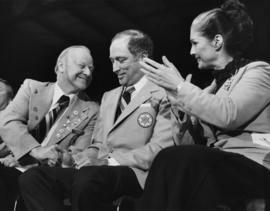 Photograph depicts Canada Games president Alex Matheson shaking Pierre Trudeau's hand while Iona Campagnolo applauds at the opening of the Canada Winter Games in Brandon Manitoba. 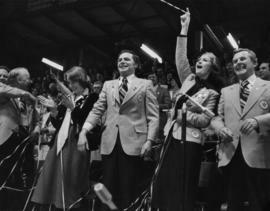 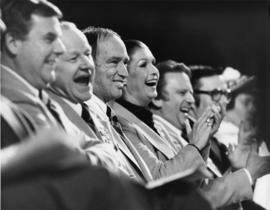 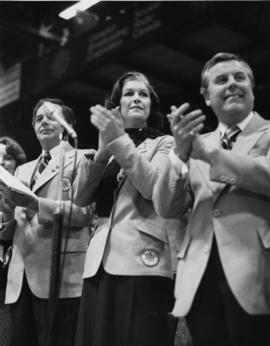 Photograph depicts Iona Campagnolo, Pierre Trudeau, Canada Games president Alex Matheson, and others smiling while clapping at the opening of the Canada Winter Games in Brandon Manitoba. 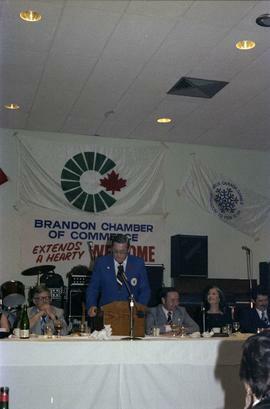 Photograph depicts a man standing at a microphone at the kick-off for the 1979 Canada Winter Games in Brandon Manitoba.